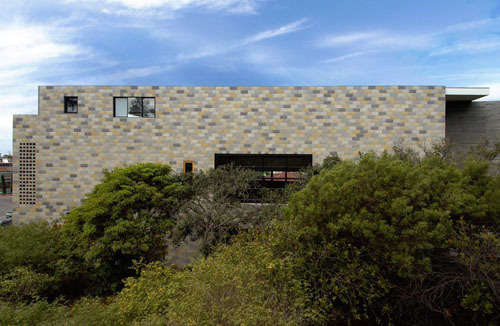 The Bold roof profile of Avocado Acres (Aa) House exemplifies our focused design collaboration with Architect, Lloyd Russel to inject a dose of creativity + Mod Green Architecture into a coastal infill project. This new residence is all about addressing the conditions of the now for the future – sustainable materials, energy efficiencies and environmental sensibilities. In a state where modernist architecture tours are a popular pastime for visiting design fans, it’s apt that California still has architectural practices looking to the past to inspire the homes of the future, witnessed in the new work of company Surfside Projects and architect Lloyd Russell. Named The Avocado Acres House, the newly built private residence in Encinitas in the north of San Diego mixes contemporary concerns of environmental impact and sustainability with the design chops of the modernist movement, creating a structure with sloping angles and sweeping lines that connect it to its habitat. Set on the stunning Mt Camel Beach 250 acre oceanfront heritage property, famous for its long golden sands, guests can experience absolute privacy while immersed in the pristine coastal wilderness. The architecturally designed bespoke box is inspired by the simplicity of the classic west coast fisherman's caravan or shack. . Even after the economy went through its rough spot, the desire to live in modern design was still high. Purchasing an entire home was far too expensive, though. That’s when Russell came up with the idea to build unique contemporary living units available for rent. We were lucky enough to get to speak to Russell about this property and his inspiration behind it. When architect Lloyd Russell decided to build his house here, he was determined to embrace the drama of downtown. Stand on the mezzanine of his daring new structure today, and you see not only the skyline of a growing city, but also a stream of cars speeding along Interstate 5 and roaring jets touching down at the international airport. This mixed use building is located in Little Italy in San Diego. If you’ve never been to San Diego, Little Italy is an up-and-coming modern neighborhood featuring some fairly affordable condos (for San Diego). When I lived there, I used to drive to Little Italy to go to Blick Art Supply and sometimes stopped for something yummy to eat.